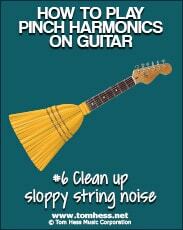 Do you know any guitarist who doesn't like the sound of pinch harmonics? 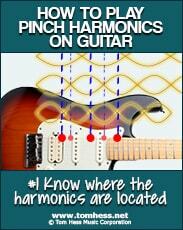 Pinch harmonics are a lot of fun and they make anything you play sound better right away. Unfortunately, most guitar players struggle to play pinch harmonics, because they don't know how to practice this technique correctly. 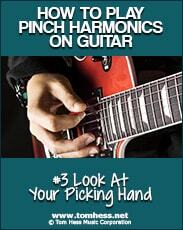 You don't need a lot of practice time to master pinch harmonics. What you need is to avoid 6 common mistakes that make pinch harmonics harder than they should be. Watch the video below to see how I helped one of my students to improve his playing of pinch harmonics in just minutes. To play articulate pinch harmonics, you must know where to strike the string with the pick and you must hit the string in that spot every time. If you simply strike the string in a random place, you will likely hear a sloppy noise instead of a clear harmonic and you won’t be able to consistently produce clean sounding pinch harmonics any time you want. Invest time to find the sweet spots on your guitar where you can produce the harmonic most easily. To do this, practice playing the harmonic in many different places along the string (sliding the pick up or down) to find where it responds the best. Watch the video above to see this approach demonstrated. IMPORTANT: Make sure to pause for 1 second between each pick stroke to LISTEN if the harmonic came out clear and strong before making any adjustments. Your ears and mind must be focused when practicing this technique. Practice playing a scale (any scale) with all downstrokes while holding the pick very close to the tip. This will train your thumb and pick to strike the string at the same time, which is key to making the harmonic come alive. 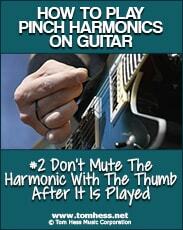 This will also train your thumb to NOT touch the string after you picked it (giving harmonics a chance to scream). All this will help you to produce the harmonics more consistently. guitar licks using these 5 steps. unique playing style as a guitarist. Most guitar players are so used to looking at their fretting hand while playing, that they completely forget to pay attention to (and look at) their picking hand when practicing pinch harmonics. By looking at the incorrect hand, you cannot identify what you are doing wrong and what needs to be fixed to finally master pinch harmonics. Stop looking at your fretting hand (when practicing pinch harmonics) and watch your picking hand instead. Most guitarists become so focused on learning pinch harmonics in isolation, that they never practice applying this technique into guitar riffs and solos. 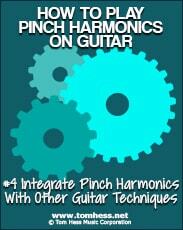 This makes all the time you invested into mastering pinch harmonics virtually worthless…since you won’t be able to use the technique when it counts. To test how close you currently are to mastering all of the most important lead guitar techniques, take this free guitar technique assessment. Set aside a portion of your pinch harmonic practice time to practice them in musical contexts… even if you still haven't mastered them in isolation. For example, think of a cool riff you like and implement pinch harmonics into it. As your pinch harmonics get better in isolation, ALL of your guitar playing (where these harmonics are used) will start to sound better as well. 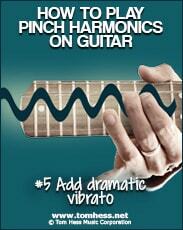 Without vibrato, your pinch harmonics will sound lifeless. Even though vibrato itself is a completely separate technique, you MUST master it and integrate it with pinch harmonics to make them sound truly badass. Vibrato helps the harmonic to sustain longer and have a more aggressive/screaming sound. Think of pinch harmonics like fire and vibrato like the fuel for it. Every time you light the fire, pour fuel over it and make the flame grow larger! Set aside 10-15 minutes per day to practice and train your vibrato, just as you would work on any other guitar playing skill. To learn how to use vibrato to play killer pinch harmonics, read this article about how to master guitar vibrato. Controlling unwanted string noise is important no matter what you play, but it is especially important when playing pinch harmonics. Any little sound in the background (that shouldn't be there) will destroy the entire pinch harmonic and the emotion you intend to create with it. Use a combination of techniques in both picking and fretting hands to mute all strings except the one you are playing. The most effective technique to use for achieving this goal is the thumb muting technique - using the picking hand's thumb to rest on the lower (in pitch strings) and mute them. This is a technique I teach all my online guitar students to master to help them learn to play lead guitar cleanly. To learn more about this (and other) techniques for muting string noise, read this article about stopping guitar string noise. Now that you know how to avoid the most effective ways to practice pinch harmonics, realize that this technique is only a tiny element of all that goes into becoming a truly awesome lead guitar player. To learn what other areas of your lead guitar technique you must improve to fully reach your musical goals, take a few minutes to test yourself and find out how close you are to mastering electric lead guitar technique. Learn how to become a great guitar player with electric guitar lessons online.